Yeshiva University students and alumni from across the University’s many Judaic studies programs and around the globe came together today to celebrate their historic siyum [completion of a unit of Torah study] on Masechet Kiddushin. 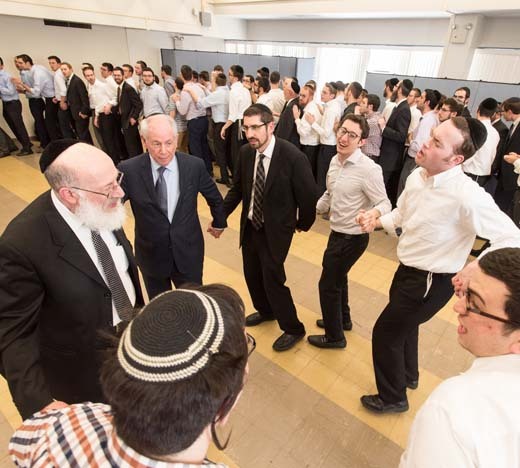 More than 100 students completed the masechta together, including undergraduates, students at the Rabbi Isaac Elchanan Theological Seminary, students in the Gruss Kollel in Israel, and alumni who have continued their regular learning in the Jacob and Dreizel Glueck Center for Jewish Study, making the siyum the largest in Yeshiva history. The learning toward the siyum was completely voluntary and regularly conducted during Yeshiva’s night seder program, during which four rebbeim—Rabbi Yitzchok Radner, Rabbi David Weiss, Rabbi Moshe Abrams and Rabbi Robbie Schreier—are on hand to mentor students one-on-one, answer questions about the text and build deep, meaningful relationships with each student. Students who were tested on their knowledge of the masechta will be able to earn credit toward purchases at the YU Seforim Sale.